PATEK PHILIPPE REF 5102 CELESTIAL YELLOW Patek Philippe, Genève, Celestial, No. 3580027, case No. 4439737, Ref. 5102J. Sold on December 26, 2007. 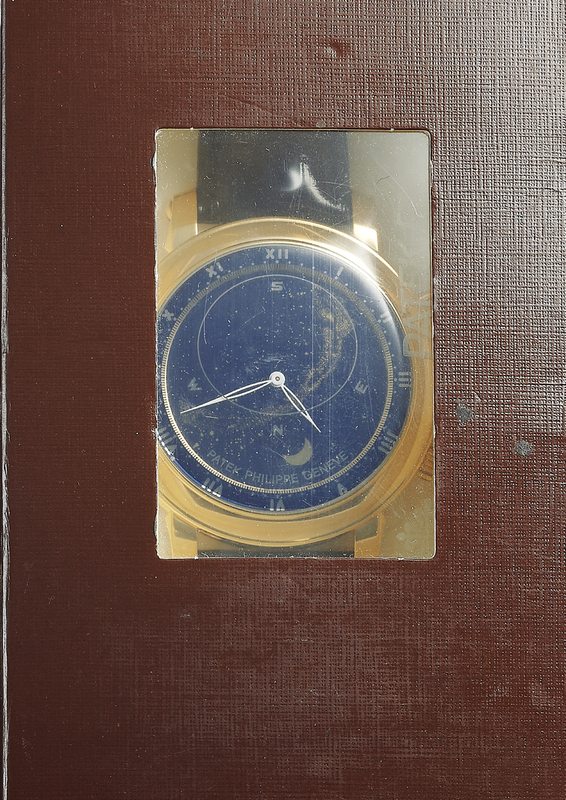 Extremely fine, rare and unusual, astronomic, self-winding, 18K yellow gold wristwatch with mean time indication, nocturnal sky chart of the Northern Hemisphere, moon phases and moon orbit, time of the meridian passage of Sirius and moon with an 18K yellow gold Patek Philippe buckle. Accompanied by the original fitted box, Certificate of Origin, and technical and instructional documents in leather folio. Three-body, solid, polished, stepped curved bezel, case band embossed with Calatrava pattern, concave lugs with screwed-bars, transparent screw-down case back, sapphire crystals. The crown at 2 adjusts the time and to wind the watch, the one at 4 adjusts the sky, lunar orbit and moon phases. Blue sky chart with gold star constellations and North/South/East/West divisions, made from 3 super-imposed sapphire crystal disks, outer divisions to adjust moon phases and sky, outermost Roman hour graduations, aperture for the moon phases. White skeletonized feuille hands. Cal. 240/165, stamped with the Seal of Geneva quality mark, rhodium-plated, fausses cotes decoration, 45 jewels, straight-line lever escapement, Gyromax balance adjusted to heat, cold, isochronism and 5 positions, shock absorber, self-compensating free-sprung flat balance spring, 22K yellow gold micro-rotor. Dial, case and movement signed. C. Three-body, solid, polished, stepped curved bezel, case band embossed with Calatrava pattern, concave lugs with screwed-bars, transparent screw-down case back, sapphire crystals. The crown at 2 adjusts the time and to wind the watch, the one at 4 adjusts the sky, lunar orbit and moon phases. D. Blue sky chart with gold star constellations and North/South/East/West divisions, made from 3 super-imposed sapphire crystal disks, outer divisions to adjust moon phases and sky, outermost Roman hour graduations, aperture for the moon phases. White skeletonized feuille hands. M. Cal. 240/165, stamped with the Seal of Geneva quality mark, rhodium-plated, fausses cotes decoration, 45 jewels, straight-line lever escapement, Gyromax balance adjusted to heat, cold, isochronism and 5 positions, shock absorber, self-compensating free-sprung flat balance spring, 22K yellow gold micro-rotor. Dial, case and movement signed. DIAM. 43 mm. THICKNESS 10 mm.